Ari began his martial arts journey in 1984 on the advice of none other than Chuck Norris (in a chance encounter) while Ari was visiting Las Vegas with his family. 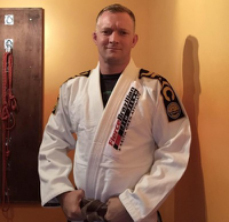 His main study started with Aikido and then moved to Japanese Jujutsu and then Brazilian Jiu Jitsu. Ari began teaching Jiu Jitsu in Victoria BC in 2003. Today, he runs Fierce Studio with his wife Lindsay. Coach Ari has trained with many instructors across the world in a variety of disciplines. After earning his black belts in Aikido and Daito Ryu Jujutsu (K Takahashi), he began training Nogi Submission Grappling under 10th Planet Jiu Jitsu Founder Eddie Bravo, earning a purple belt under him. Ari then added Gracie (Brazilian) Jiu Jitsu and holds the rank of brown belt under Pedro Sauer black belt Keith Owen. 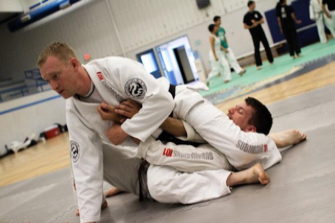 Ari is also a 4th Degree Black Belt under the direction of Steve Hiscoe of the Canadian Japanese Jiu Jitsu Union and one of the highest ranking and most experience Japanese Jujutsu instructors on Vancouver Island. Ari has traveled extensively in his quest for more Jiu Jitsu knowledge and has literally had the chance to train and learn with the planet’s best teachers. These include Professor Pedro Sauer, Ryron Gracie, Saulo Riberio, Rener Gracie, Master Renato Tavares, Octavio ‘Ratinho’ Couto, James ‘300’ Foster, Piet Wilhelm, Classy Grappler, Vinny Magalhaes, and Frank Mir. In addition to his martial arts background, Ari was involved in the security industry for nearly 20 years and wrote a book entitled The Doorman’s Credo: A Guide to Nightclub Security in 2012. He has given multiple seminars on nightclub security and is now involved in law enforcement in the Province of BC. Having earned his Philosophy degree from the University of Victoria (1999) and also obtaining his certificate in Private Investigation (2001), Ari continues to educate himself in the areas of conflict resolution, combat application and security measures. He is now involved in local law enforcement in the region. Ari is also the creator of Submissions 101, the world’s largest and most visited site dedicated to Jiu Jitsu video techniques.